The CMM Group, LLC provides turnkey design, fabrication, installation and project management services for VOC emission control, custom made Ovens and Dryers, Energy Recovery Systems, Production Machinery and Ancillary Systems and Components. From the biggest project to the smallest details, our extensive process and equipment knowledge allows CMM to meet specific project needs for a wide range of industries. At CMM, our engineers will work with a client and thoroughly study their operation to provide the proper technology selection and all the necessary support services needed to satisfy both present and future requirements for a wide range of industry needs. Trouble viewing? Download the video here. 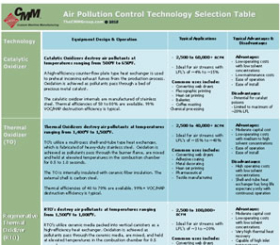 Founded in 2001 as Custom Machine Manufacturing, The CMM Group is committed to providing personalized, expert advice and competitively priced solutions to a variety of equipment needs including Thermal Oxidizers, Energy Recovery Systems, Ovens and Dryers, Air Pollution Control Systems, Production Machinery and Ancillary Systems and Components. and Not sure Where to Begin?